Straight from my knitting looms, the Patches are in town. 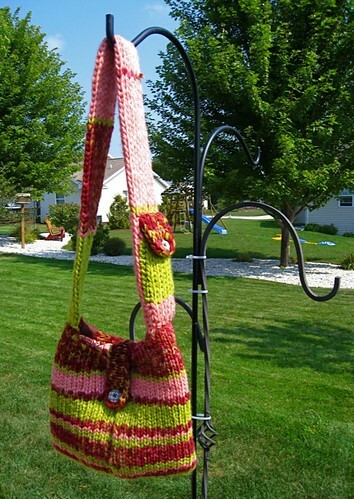 Read their story and then try out the pattern on your knitting loom! First we have Jack Patches, who hasn't been the same since he saw his brother get carved. Ever since then, triangles make him twitch. Baby Spice Patches is new to the vine and she hopes to bud many friendships. But she doesn't understand why her nickname is "Pie." Autumn Patch is ripe for the pickin' and will miss her family in the grove. She will spend the season on the porch of a nice suburb home. Cousin Viney comes off as a seedy kind of fella but has a heart filled with mushy love. Cast on all pegs with the drawstring cast-on (link to PDF instructions, developed by Brenda Myers). Follow a K2, P1 pattern all around. 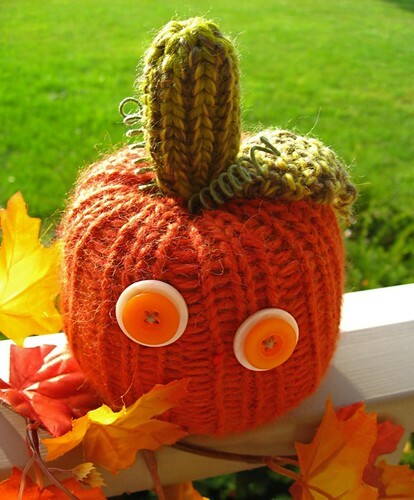 Knit for about 6 to 8 inches, depending on how tall you want the pumpkin. Finish with a gather cast-off. Pull the cast-on edge closed and bring the tail end inside. Fill pumpkin with fiberfill. Pull the cast-off closed. Thread the tail end onto a tapestry needle. 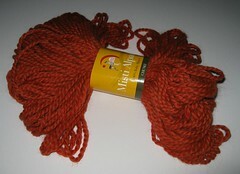 Bring the yarn through the center of the pumpkin to the bottom and then back to the top. Tug a little so that the pumpkin becomes fatter and dips toward the center. Tie a knot to lock the stitch. With your green yarn and the pink spool loom, start with one stitch on the side with 8 pegs. This will be your leaf. Use garter stitch (knit one row, purl one row) unless you want the edges to curl. The size of your leaf is your preference. Increase on both sides for a few rows, knit a few more and then decrease to 3 stitches. Wrap the yarn all around the loom and knit in the round for a couple inches. 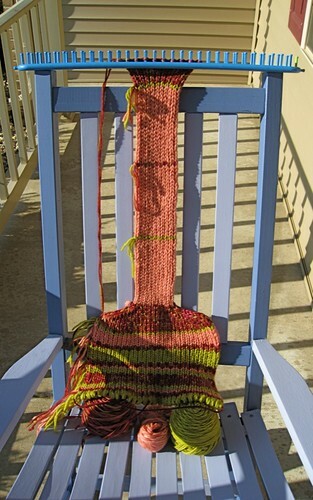 Finish with a gather cast-off and bring the yarn inside. 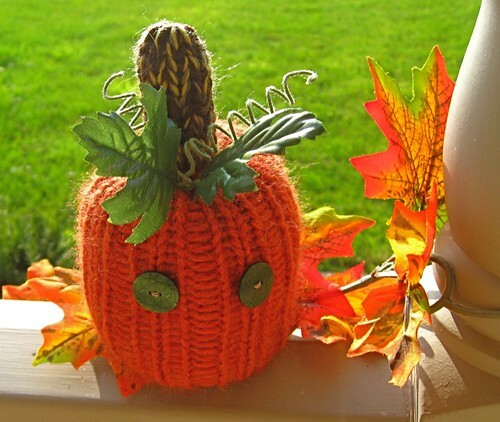 Sew the stem/leaf to the top of the pumpkin. 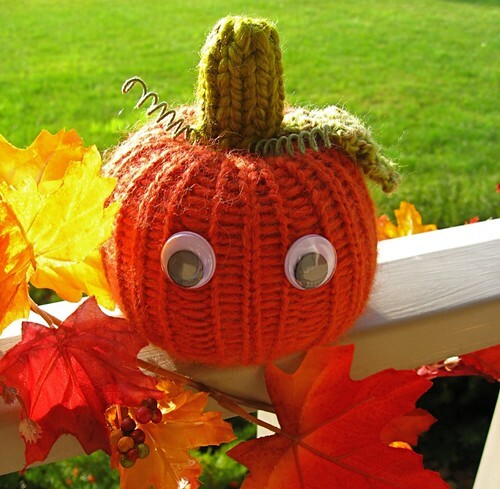 Sew on some button eyes — or you can find some sew-able googly eyes at a craft store, too. 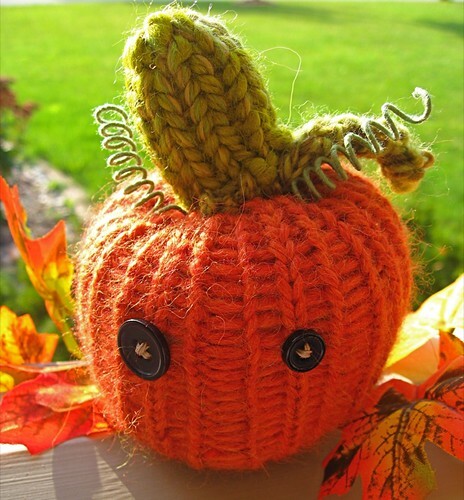 For an added touch, you can twirl some cloth stem wire around a pencil and stick them into the top of the pumpkin. 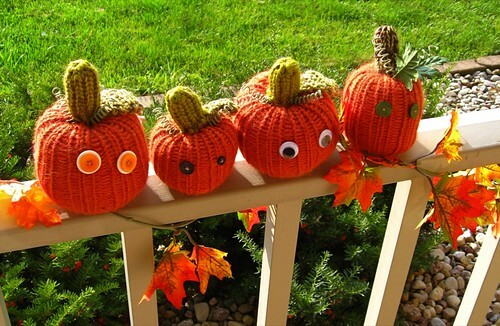 Now you have some one-of-a-kind pumpkins on a vine! Today I pay my penance for three days of creative fun. I'll sip my TheraFlu like a good girl and hopefully feel better soon. So while I lay here in my own comfy bed, here's the Saturday report. Near our hotel, we found the big blue and gold box called IKEA. The three-story store was a wonderland for window-shopping but no purchases were made. I chanted "Don't wanna pay 10% county tax" over and over in my head. 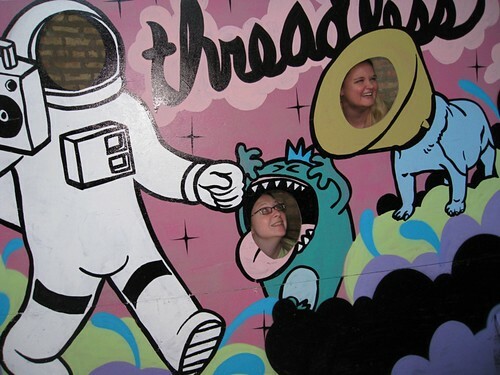 Then we hit the highway for the Threadless warehouse. We poked our heads into the doors and ... then into a photo board. 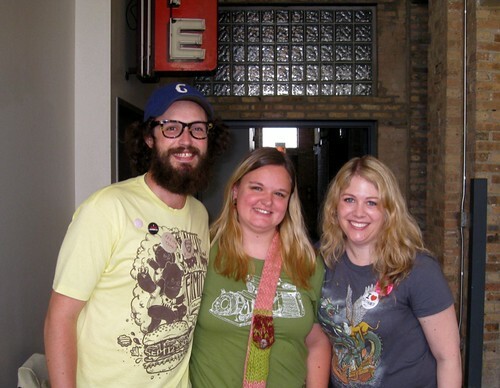 I reconnected with my Threadless buddies and Zoe met a handful of new, amazingly talented folks. We made our own buttons and watched some live dancin' and drawin'. I grew a mustache and we took in a tour on our way out. Festa, me, Lori and the letter "E" ... More photos are on my Flickr! 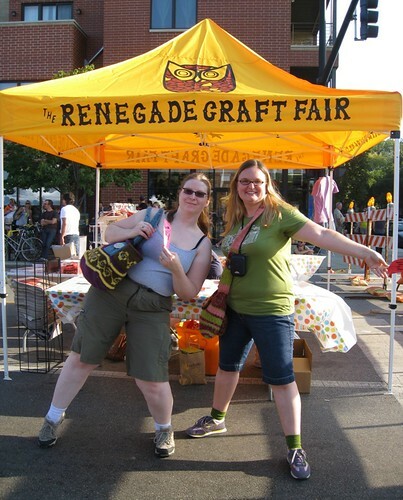 It was now time for the two-hour Renegade Craft Fair marathon. Those white tents seemed to go on and on for blocks. We thought we were going to hit the lake — or at least the edge of downtown Chicago — before we could turn around. We reined in our spending, studied pricing for our own upcoming craft fair and found just a few treasures. Zoe bought a pretty glass ornament. I snagged some retro earrings made from typewriter keys. 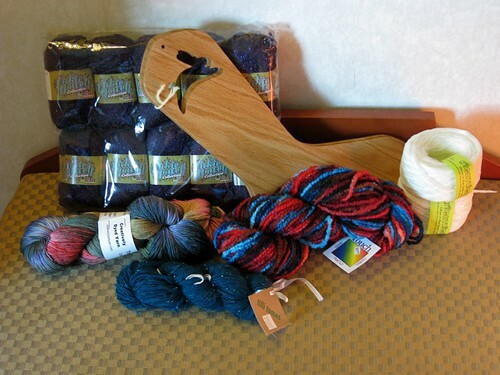 And, of course, we both bought yummy yarn. One more detour loomed as we headed out of Chicago. 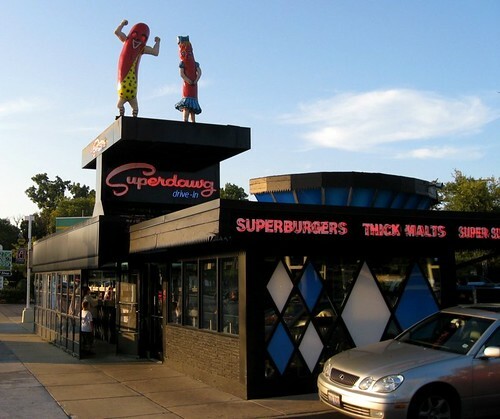 We stopped to say "Hiya" to the Superdawg statues at the drive-in restaurant. With some greasy, delicious food in our bellies, we then said "Bye-a!" to our crafty vacation. 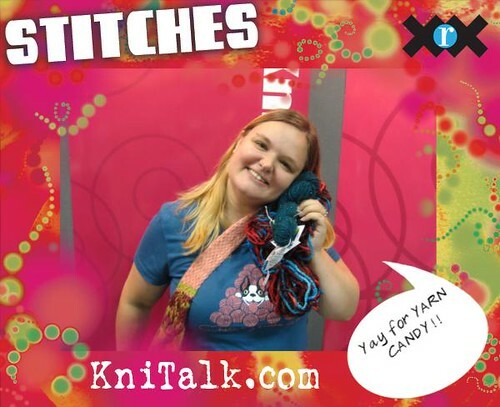 Hello from Stitches Midwest! 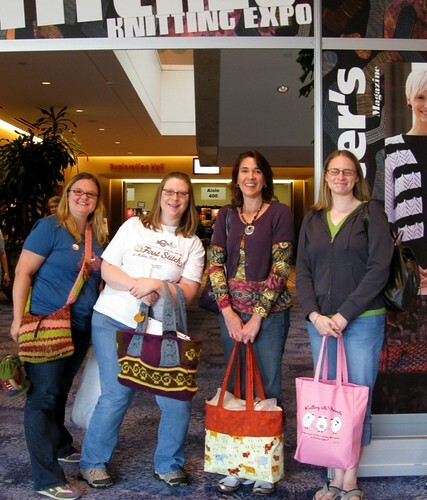 It's a mega-fun yarn expo kinda in Chicago. And it was my first one. And I was like a kid in a candy store. First stop was the Stash Wall. They WANT you to take the yarn! Well, you can have a snippet. Photos were forbidden in the marketplace world. You know those designers, wanting to protect their creative work. But we snagged a group photo by the entrance later on. 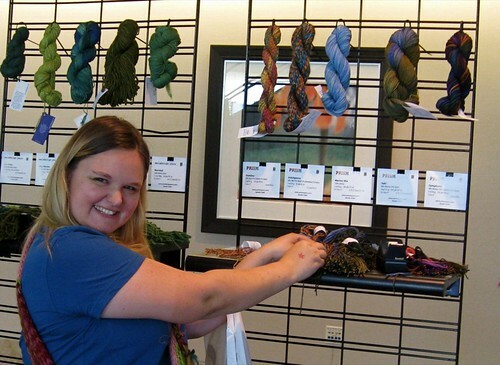 My friend Zoe made a beeline for the Buffalo Gold yarn guy — yep, beautiful yarn from those big buffalos! I resisted making any purchases (for a little longer). We got to try out some pretty neato stuff. And I got to show off my loom-knitting skills to those not in the know. I tried my first needle-felting and punched out a cute pumpkin! I want a needle-felting kit now so I can take out any aggression by stabbing roving. Later in the afternoon, it was time for a caffeine boost. 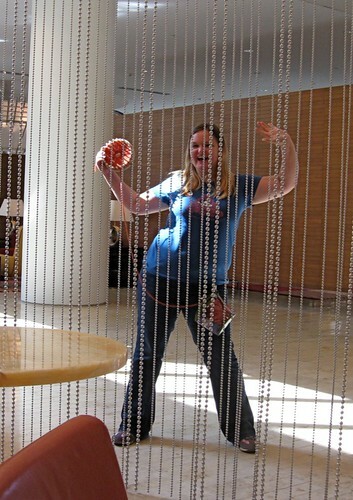 And with that jolt, comes dancing by the beaded curtain — with the loom as a tambourine. In the big bag in the bag is enough yarn to make my first sweater. In front of that is a little sock yarn splurge from Creatively Dyed yarns. Dianne (creative from Ravelry) was super nice in person and so much fun! I wasn't planning on sock yarn but she made it happen. I got my first sock blockers so I can make patterns really pop! And my mom should love that I found glow-in-the-dark yarn, on the far right there. It's amazingly strong. A bumpy bulky yarn, appropriately called Touch, is in the middle and some pretty beaded yarn is in the front. We wrapped up our day with some Mexican food and margaritas served by a waiter named Leo. He said the more we drank, the more fluent our Spanish would become. 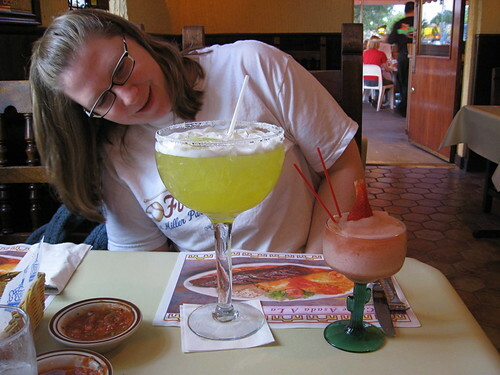 Well, my drink was pretty small (being the driver) but I was remembering quite a bit by the end of the meal. By his reasoning, Zoe's drink should have made her a fluent speaker! It's time to stretch and relax ... before the Renegade Craft Fair and Threadless meetup shenanigans tomorrow! And drooling at a several-block-long Renegade craft fair. Right from the beginning, I realized how fast the project was going to knit up. I was thrilled and felt not so crazy. But boy oh boy, was I in for it with this lil' bag. I am happy to say NOW this story has a happy ending and I'm about to hit the road in a couple hours, purse in hand. But this was after a week of running out of yarn, ripping back several rows and destroying a few pieces of fabric. 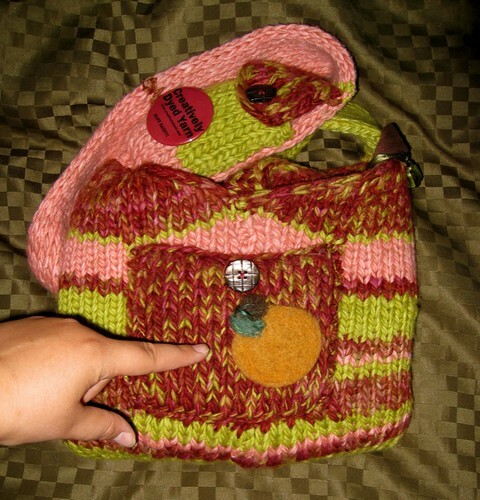 For my loomy friends out there, here are my adaptions to the Bee Bopper Bag pattern from Lion Brand yarn. 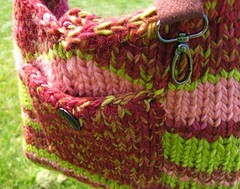 Those who have knit this project before me have blogged the bag turns out rather small. So I made plans to make the purse a little bigger and the shoulder strap a little longer. I cast on 30 stitches for double-knitting. I used burgundy-green instead of cranberry, green instead of brown and pink instead of white. I followed the pattern for changing colors until the five rows of green. I added 2 rows of burgundy, 5 rows of pink and 1 row of green. Then I returned to the pattern for 3 rows of burgundy and then decreasing. I made the strap in pink instead of green and included one row of a different color every 20 rows. (I incorrectly thought this was going to save enough yarn for the second part of the bag.) This didn't work too well because now I have bulky bindoffs and yarn poking through in those areas. I made the strap 100 rows long. I followed the pattern with my additions above for the second half of the bag. 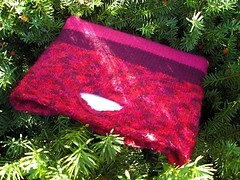 For the closure strap, I cast on 16 stitches in burgundy and knit 5 rows of stockinette. I did not fold it in half. I added a magnetic snap to the back of the strap and to the purse. I covered the snap back with a pretty shell button. I added some knit pockets as well. 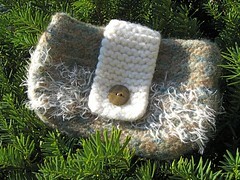 For the cell phone pocket on the shoulder strap: Cast on 8 stitches. Knit 10 rows green. Knit 5 rows pink. Stitch it onto the strap. For the pocket flap: Cast on 8 stitches. Knit 6 rows. Bind off in the middle of the board for one row to create a buttonhole. Knit 2 rows and bind off. Sew a button onto the pocket. For the back pocket: Cast on 20 stitches. Knit 15 rows and bind off. Stitch onto the back. I added a button for decoration. I might add a flap someday. I don't pretend to be a sewing expert. I'm a pillow-making gal and really, nothing more yet. So even a simple purse liner made me want to curse. But after ripping out some stitches and some fabric, too, I figured it out. First I cut about 5 inches of canvas strap. I looped that around the D-ring. And I tripled-stitched it into the purse. It's going to hold my keys and it needs to be tough. Thanks to Craft Junkie for the idea! Instead of making seams (blech), I worked the inside pocket panel much like a pillow. I sewed the 2 pieces together, wrong sides out on all sides except 1 edge. I turned it inside out. I added another row of sewing toward the top to flatten the top of the pockets. I then put it on top of the main fabric and sewed some straight lines to create pockets. I made three different depths, including a skinny one for a pen. Next I took the second piece of main fabric. With the wrong sides out, I sewed them together, leaving a half-inch on top to fold over. 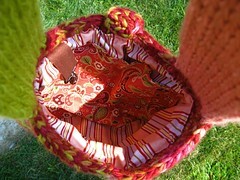 I inserted the finished liner into the purse. I used what I call the back stitch (again, not a sewing expert) to sew it into the purse. Ta-da, I have my version of the Bee Bopper bag. 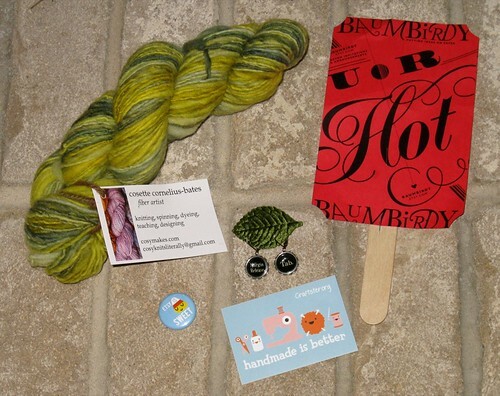 It's all ready to show off at the knitting convention. And I can say, yes, I made this on a loom!